Criss Cross Peanut Butter Cookies - Hi, friend Popular Recipes, in this article entitled Criss Cross Peanut Butter Cookies, we have prepared this article well and concise to be easy to understand for you to read and can be taken inside information. hopefully the contents of the post Article baking, Article Cookies, Article food, Article peanut butter, Article recipe, that we write this you can understand and useful. okay, happy reading. It was late in the afternoon when I decided I needed to bake up a batch of these cookies. Stephen's brother was on his way over for dinner and all we had for dessert was about 1 cup of peanut butter chunky monkey ice cream. I had planned on using it to make mini milkshakes but I thought we needed to have a little something more. Thankfully, these cookies only took a few minutes to whip up and once they came out of the oven they were ready to eat. As a peanut butter lover I thought that these definitely hit the mark. 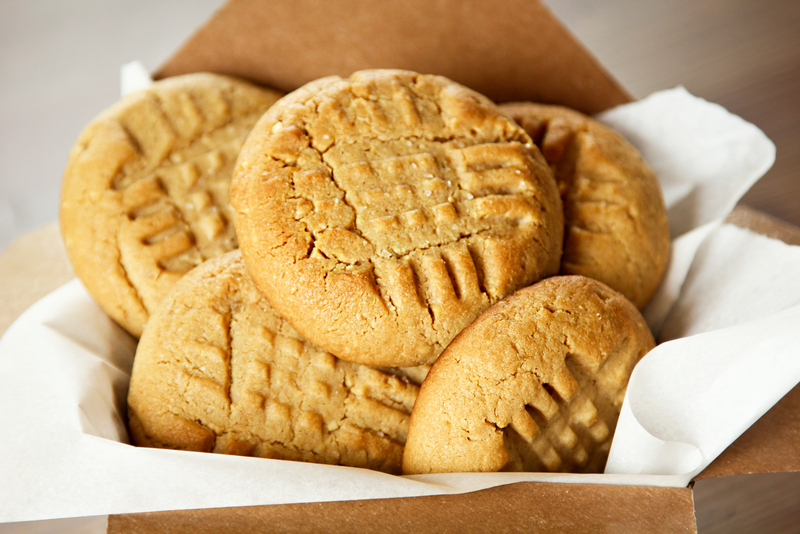 They're packed full of peanut butter flavor and the ground bits of peanuts only add to it! Yum! 1. Preheat oven to 350 degrees. Line two baking sheets with parchment paper. Set aside. 2. In the bowl of a stand mixer, beat butter, peanut butter, sugar and vanilla until smooth and fluffy (about 3 minutes). Add egg, mixing until incorporated. 3. In a small mixing bowl, whisk together flour, baking soda, baking powder, salt and ground peanuts. With mixing speed on low, gradually add dry ingredients. Mix just until combined. Chill dough for 15 minutes before baking. 4. Scoop 2" balls onto prepared baking sheets (I put 6 on a sheet). Using a fork, press a criss cross pattern into each cookie, flattening them out a bit. Sprinkle with sea salt. Place into oven and bake for 12-14 minutes. 5. Remove from oven and let cool on sheet for 5 minutes before transferring to a wire rack to cool completely. Thank You and Good article Criss Cross Peanut Butter Cookies this time, hopefully can benefit for you all. see you in other article postings.